kala azar (leishmaniasis) is difficult to treat. Inaccurate diagnosis saw this disease take its toll on 33,000 Indians in 2008. An occurrence more of the poverty-stricken countries, very little research exists on Leishmania-- the protozoan responsible for it. So far the protozoan was only known to reproduce asexually via cloning. Hybrid strains were seen in nature but their presence could not be explained. Researchers from the US have attempted to do that. Their study also explains why it is so difficult to eliminate this parasite. The blood-sucking sand fly is the natural vector of Leishmania. Four to five days after the protozoan enters the fly's bloodstream, it migrates to its salivary glands. 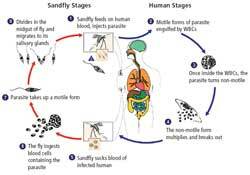 When the fly feeds on the blood of a human, the protozoan gets transferred.Here it takes up a non-motile form and is able to withstand the white blood cells (wbcs) that attack it, thus completing its life cycle. The team infected a sand fly with two different strains. Each strain was resistant to a specific antibiotic. After five days, the sand fly's blood was analyzed. They found a new strain resistant to both antibiotics indicating the two strains had exchanged genetic material. This suggested sexual reproduction. "Clonal reproduction is the best option for the parasite to flood the host with. Under environmental stress, the protozoan may switch to sexual reproduction," said Michael Miles of the London School of Hygiene and Tropical Medicine in a commentary on this research. Emphasizing on the importance of the find, Jean-Claude Dujardin from the molecular parasitology unit at the Institute of Tropical Medicine in Antwerp, Belgium, said, "Sexual reproduction allows the parasite to fight against the immune response of the host and the drugs we use to kill it. If Leishmania could only reproduce clonally, it would be easier to eliminate it. We should resort to combination drugs to treat this disease." The research published in the April 10 issue of Science also indicates the location of the havoc-causing genes in the dna of Leishmania. The next step, say the researchers, is to pinpoint the specific genes that are involved. This will help develop drugs to combat this disease. "Currently clinical trials for combination therapy are under progress but it will take time before they can be implemented in health policy," added Dujardin.